Last Friday, ETT members, executives, community, and office staff took part in wearing #RedForEd in protest against the Ford government’s sweeping cuts to public and post-secondary education. The #RedForEd movement started in the United States in 2018, and was strengthen and solidified through the mass demonstration against corruption and cuts to the public education system. It is scary to think that the government believes in scaling back education altogether is in any way a good solution– especially on the backs of the weakest and most vulnerable: students with disabilities, from low-income families, or scrapping the potential of quality education from the youngest of them all – kindergarteners. Improving public education for sustenance and quality means mapping it to the skills our society needs but also reaffirming a commitment to the democratic society we live in. This movement is now gaining traction in Ontario in wake of the PCP’s cuts to public education. When over $25 million cuts in education are being made in conjunction with an annual $10 million injection towards the horse race-industry, it becomes evident who exactly Ford is “for”: his wealthy friends. It is obvious that the PCP government has little to no regard on the long-term effects on education that these cuts impose; the proven research that Ford has readily and quickly dismissed. 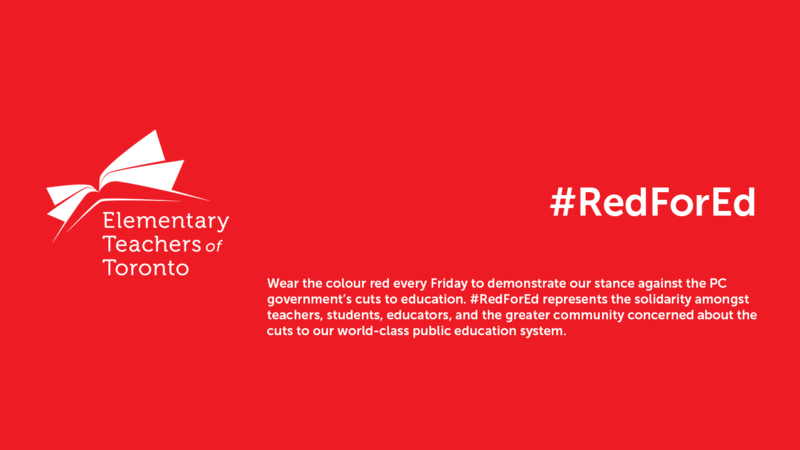 ETT will stand with our education community members in solidarity every Friday by wearing red, to demonstrate against this attack on public education. We will keep you updated as more actions are planned across the province and we welcome your ideas, energy, and creativity in defending public education.